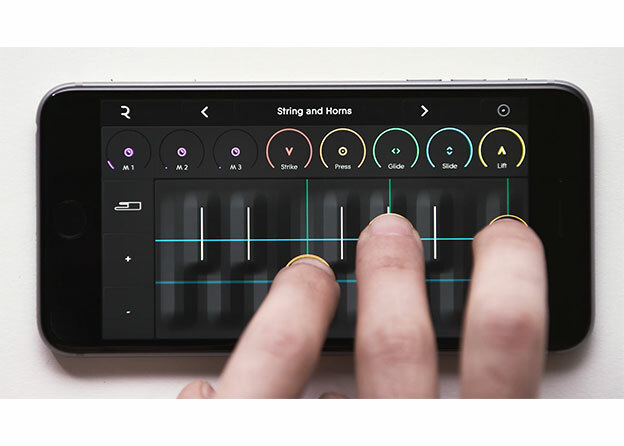 LONDON--(BUSINESS WIRE)--Music creation startup ROLI today announces the release of NOISE, an app – now available for free download on the App Store – that realizes the expressive music-making potential of the iPhone. Building on years of research at ROLI into touch-sensitive musical interfaces, NOISE is the most full-bodied instrument to ever hit the glass surface of an iPhone. Mobile phones and tablets are an increasingly important tool for people to make music, but music apps have lacked the depth of expression of acoustic instruments. That all changes with NOISE, which turns the iPhone screen into a continuous sonic surface that responds to the subtlest gestures. Taking advantage of the new 3D Touch technology of the iPhone 6s, the surface lets music-makers shape sound through Strike, Press, Glide, Slide, and Lift - the “Five Dimensions of Touch” that customers and critics have celebrated on ROLI’s award-winning Seaboard RISE. NOISE is ROLI’s latest breakthrough in making digital music creation more connected and more mobile. With a Seaboard RISE, a Flip Case, and NOISE on their iPhones, music-makers now have a connected set of portable tools for making expressive music on the go. ROLI is a London-based technology company that is creating a more connected music ecosystem. The award-winning Seaboard RISE and Seaboard GRAND are redefining how expressive a musical instrument can be. Equator, ROLI's groundbreaking software synthesizer, is opening new possibilities for multidimensional sound control. As the leading C++ framework for audio, JUCE is making music applications run faster. Blend.io is sparking creative collaboration by letting music-makers share their projects on an open social platform. Through hardware, software, and social products, ROLI is making a new chain of tools for contemporary music creation.